Clinicians will focus on the players' safety and injury prevention, injury and illness care, and performance improvement. 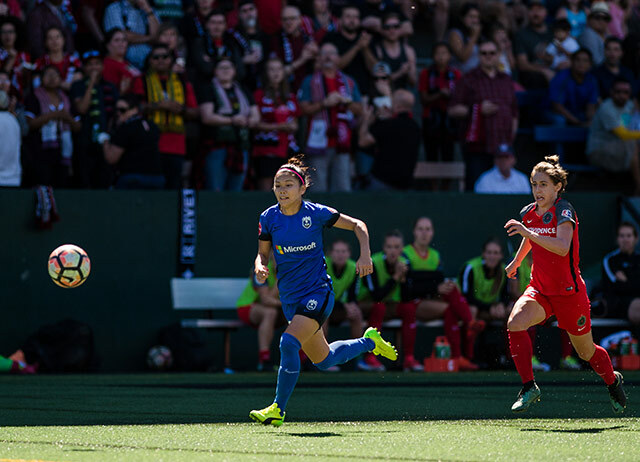 Reign FC forward Nahomi Kawasumi is chased by a Portland Thorns FC player. Seattle Reign FC and UW Medicine have announced a three-year partnership that makes UW Medicine the Official Health Partner of the club. UW Medicine has provided medical assessment, treatment and care for the professional team since the start of the 2017 season. The comprehensive care plan focuses on three key services: player safety and injury prevention; injury and illness care; and performance improvement. The Reign FC coaching staff also works with UW Medicine to create individualized treatment plans to keep athletes fit and healthy. During the National Women’s Soccer League season, UW Medicine clinicians and physical therapists provide care throughout the week. Providers are present at all Reign FC home matches in the event that their support is needed. “UW Medicine has made a profound contribution to our organization. I am excited to continue developing the partnership,” said Nick Leman, the team’s director of high performance and head of strength and conditioning. The club's home opener against the Washington Spirit is at 7 p.m. PT March 24 on the UW Medicine Pitch at Seattle's Memorial Stadium. Reign FC 2018 season ticket memberships and single match tickets are available.